And my legs and feet weren't too warm either. Weird weather-wise cycle into work this morning that was. No snow or ice at all for half the journey, then, around another a corner, and the road and pavements were coated with a sheet of icy snow. Took it nice and slow from there, even having to find another route near the end when I could hardly keep the bike vertical even when I was using my feet as outriggers. Stopped along the route to snap the icing sugar dusted top of Dumyat. There was no snow lying anywhere when I left the house, but a nice crispy crust was bedded in by the time I made it to work. Headed out to capture it before the sun melted it all away (it didn't; stayed below zero most of the day). The monument to Willy Wallace in the distance lines up nicely with this old set of steps down to the River Forth. It gets photographed a lot. The Royal Navy's Sea King helicopters from HMS Gannet, were conducting one last tour of their beat today. As the service has now been privatised this was to be their last official engagement, and they couldn't have picked a finer day for it. 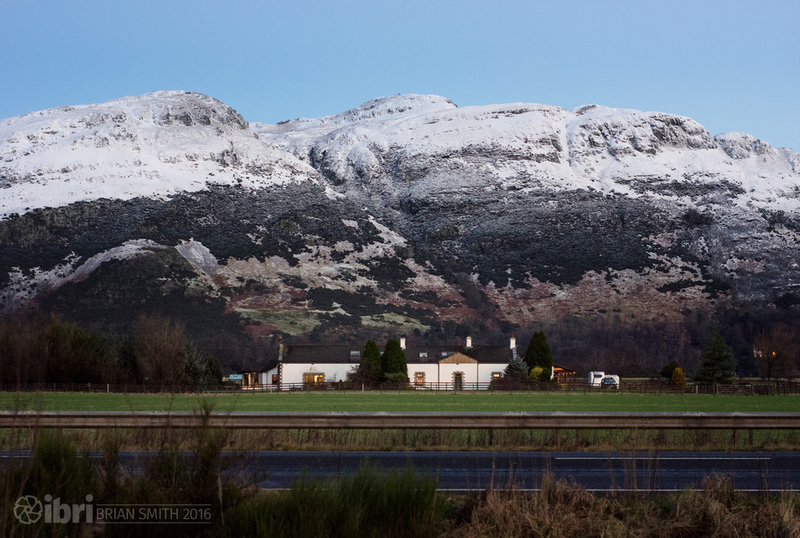 The two aircraft, with the accompanying chopper filming the flight, looked impressive against the snowy landscape as they came in low over the carse of Stirling, circled both the Wallace Monument and Stirling Castle, then headed off down the River Forth towards Edinburgh. And there were plenty of camera pointing skywards to catch their every manoeuvre.